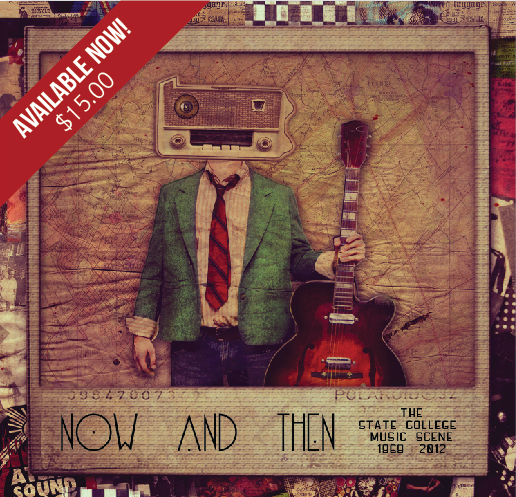 “Now And Then” chronicles forty-four years of original music from the small college town of State College, Pennsylvania. This 40-track double disc release takes listeners through the tiny pubs, late night jam session. Running parallel to national trends, the music on the “Then” disc is a sonic time machine— from the bubble- gum era sounds of The Wooley Thumpers, to the Crosby Stills and Nash-inspired “Look At Me” by Morn- ingsong, every listener will have a home in the record. The record even dabbles into country and bluegrass music with Whetstone Run‘s “Spanish Girl”— a pitch perfect recreation of Marty Robbins. Perennial State College music fans will not be disappointed, as many of the classic local bands make an appearance, from the legendary Cartoon with “In My Dreams Tonight,” to the still-thriving Triple A Blues Band with “Call Home Blues,” from party rockers Sideshow Bob and “As She Says,” all the way to Queen Bee and the Blue Hornet Band with “Take Your Lies Home To Mama.” Tahoka Freeway ring a bell? The Dirges? The SEEN? Original Soul Project? Out of the Blue? Blue Suede Groove? They all have a home on the album. More recent fans of the Centre Region’s music scene are in for a treat. The “Now” disk gives us rock, alter- native and country sounds—the pop perfection of Ocean Grove’s “Say Goodbye”, the beer soaked sing- along of Katsu’s “Walkaway”, The Rustlanders’ Americana epic “Holdin Out”, and the prettiest harmonies on this side of the Mississippi with Pure Cane Sugar’s “My Favorite Song.” Popular local acts like My Hero Zero, Atlas Soundtrack, The Nighcrawlers, and Jason Davoli (Lowjack) also make musical appearances. First and foremost, “Now And Then” showcases songwriters— from the raspiest-voiced social prophet to the smoothest crooner— this double-disc collection shines a light on the national-caliber songwriting that has blessed Happy Valley. Fans of heartbreak, double entendre and clever wordplay will have the most fun with this collection, which features honest songs that were written by the artist’s themselves— no big. Local songwriter Ted McCloskey gives us the rocking “As Fast As I Can” and Apache Record’s president Phillip Masorti gets down and dirty with “Crimson.” Jon Rounds takes us back in time with “Wrong About You,” while his brother Jamie Rounds delivers with “Catch a New Wave.“ Along with songs by local fa- vorites John Cunningham, Kris Kehr, Dawn Kinnard, Pat McGinnis and newcomer Harold Taddy— those of us who love the songwriting craft will not be let down. Dedicated to helping victims become successful survivors of abuse through education. All the proceeds are being donated to the local Happy Valley Cares (Child Abuse) Charity. The artwork for the album was created by Emily Burns, a former Penn State student. You can buy your copy online here: http://www.apachemusic.net/ or go to Webster Cafe, Lamont Cafe, or The Phyrst. You can also find their Facebook page here.